A new poll released today shows strong support for LGBTQ nondiscrimination protections among small business owners nationwide. The poll, which surveyed 500 small business owners across the country, found overwhelming support for federal protections prohibiting discrimination on the basis of sexual orientation and gender identity/expression—and consistent opposition to laws that would allow for discrimination against LGBT customers. 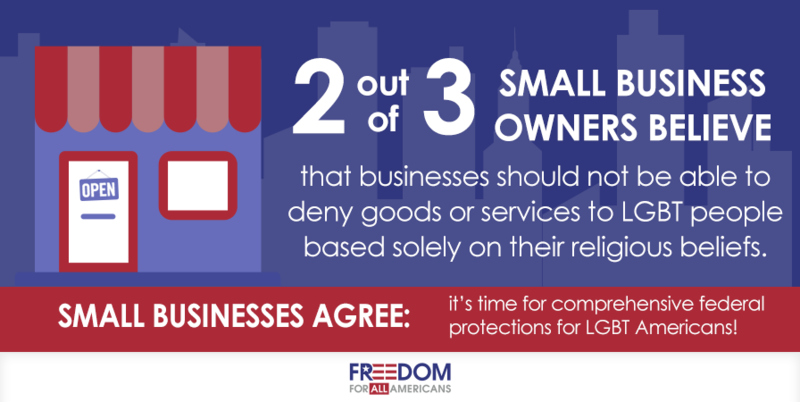 Two-thirds of small business owners don’t believe businesses should be able to deny goods or services to LGBT people based solely on their religious beliefs. Eighty percent of small business owners support federal protections for LGBT people covering public accommodations – public spaces like restaurants, shops, hotels and parks. Nearly 60 percent of small business owners reject laws that would allow individuals or businesses to legally refuse service to LGBT people based on religious beliefs. Over the last several months alone, businesses large and small have played a pivotal role in advancing support for LGBT nondiscrimination protections. Most notably in April, countless business leaders and local companies spoke out strongly after Governor Mike Pence signed Indiana’s Religious Freedom Restoration Act (RFRA) into law. The law took a heavy toll on both the state’s reputation and Governor Pence’s approval rating—highlighting the harmful impact of discriminatory, anti-LGBT legislation. From state legislatures to the halls of Congress, we’re proud to partner with businesses in our campaign to win nondiscrimination protections for LGBT Americans. In the coming weeks and months, Freedom for All Americans will continue to elevate the voices of small business owners as we make the case to lawmakers that now is the time to modernize non-discrimination laws to prohibit anti-LGBT discrimination.